South Korea said last week four more launchers had been introduced, months after the controversial battery was deployed in March with just two of its maximum load of six launchers. 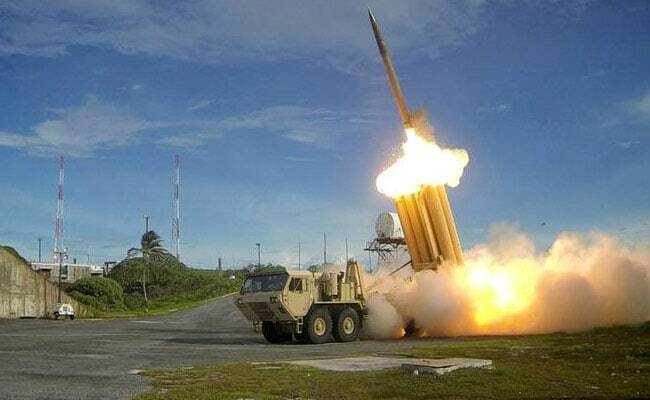 Seoul: South Korea will hold off on installing remaining components of a U.S. anti-missile defence system until it completes an assessment of the system's impact on the environment, the country's presidential office said on Wednesday. The move could mean substantial delays in a full deployment of the Terminal High Altitude Area Defense (THAAD) system in South Korea, as the review may take well over a year, according to a senior official at the presidential Blue House. The additional launchers had been brought in to the deployment site in the southeastern region of Seongju without being reported to the new government or to the public, new President Moon Jae-in's office said last week, asking for a probe into why it was not informed of the move by South Korea's defence ministry. The four launchers have yet to be installed and made operational. "It doesn't make sense to withdraw the two initial launchers which had already been deployed and installed, but additional installation will be decided after the environmental impact assessment is over," the administration official told reporters on Wednesday. "Whether we must urgently move forward with additional instalment by ignoring legal transparency and due procedure is a question." The Pentagon said it would continue to work transparently with Seoul but did not signal any expectation that the decision to deploy THAAD would be upended. "The U.S. trusts the (South Korean government's) official stance that the THAAD deployment was an alliance decision and it will not be reversed," a Pentagon spokesman said. "We look forward to continuing our close coordination with the Moon administration," U.S. State Department spokeswoman Anna Richey-Allen said when asked about the South Korean decision. U.S. Congressman Republican Ed Royce said in a statement that the missile system was critical to protecting South Korea. "I hope any environmental concerns related to the full deployment of THAAD will be dispelled with a quick and thorough review," said Royce, chairman of the House of Representatives Foreign Affairs Committee. U.S. defence company Lockheed Martin Corp is the lead contractor for the THAAD system. North Korea has conducted three ballistic missile tests since Moon took office, maintaining its accelerated pace of missile and nuclear-related activities since the beginning of last year in defiance of U.N. sanctions and U.S. pressure. During his successful election campaign, Moon had pledged to review the previous South Korean government's decision to deploy THAAD, saying the deployment was rushed without assessing its environmental impact or seeking parliamentary approval. Moon's decision to order an investigation into the deployment came amid signs of easing tensions between South Korea and China, North Korea's sole major diplomatic ally. The decision to deploy the system was made by Moon's conservative predecessor Park Geun-hye, who was impeached and thrown out of office in a corruption scandal that engulfed South Korea's business and political elite. Moon took office on May 10 without a transition period because a snap presidential election was held just two months after Park was ousted. He inherited her defence minister, along with the rest of the cabinet, and has yet to name his own. Moon has said his order for the probe at the defence ministry was purely a domestic measure and not aimed at stopping the deployment, which has drawn angry protests from China.